Moritz Lobstein was born in Borculo on 28 March 1881 as the son of Salom Lobstein and Esther Hes. Besides Salom there were four other children: Michiel, Jacques, Gonda and Reina. The most famous of them was neurologist Jacques Lobstein from Apeldoorn, medical superintendent of the Jewish psychiatric institution Het Apeldoornse Bos. During the war he took care of many Jews in his clinic. He died in Tröbitz on 7 may 1945. In 1907 Moritz married Catharina van Huiden who was born in Winschoten on 19 March 1880. She was a daughter from a second marriage of tanner and trader in leather Mozes van Huiden and Johanna van der Heijden. The other seven children were: Abraham, David, Aaltje, Salomon, Isidor, Henriette and Michiel. Mozes had been married before to Frederika van Es, who was born in Meppel and died in 1877. From that marriage six children were born: Michiel, Frederica, Abraham, Maurits, Wilhelmina and a stillborn child. Moritz and Catharina had four children: Salom, Moritz (who died a few days after his birth), Johanna Frederika (Annie) and Esther Sophie (Els). When the war began the children had all left Meppel. Els settled in Amsterdam in 1931, Annie went to Leeuwarden in 1933 and Salom went to study in Rotterdam in 1939. 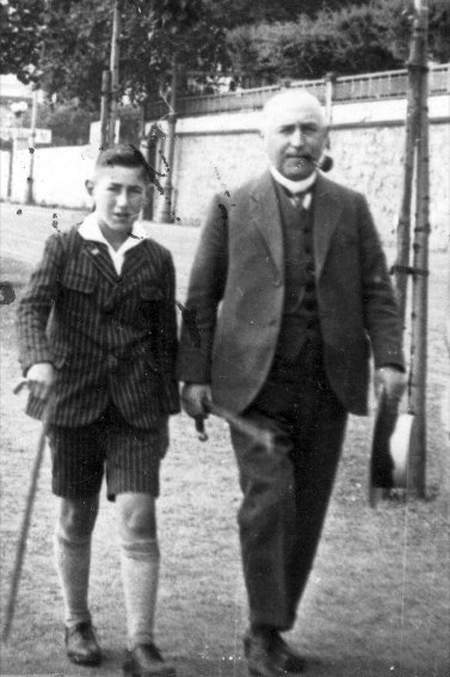 Moritz Lobstein and his son Salom. Besides his job as trader-producer of spices, Moritz Lobstein developed into a (local) administrator of statue with a great number of church- and social functions. He got a national reputation because of his work for a church organization for the Jewish Dutchmen in the Dutch East Indies. From 1927 till 1941 he was a member of Meppel town-council and from 1927 till 1935 he was also alderman and deputy mayor. In those functions he put his stamp on the administration of Meppel local council. He got on well with mayor Knoppers. Together they achieved a lot in the period between 1927 and 1935. By order of the German authorities the activities of the Jewish Council for Amsterdam were extended to the whole country. For every province and the town of Rotterdam one representative of the Jews and a deputy are assigned, who are subordinate to the Jewish Council for Amsterdam. Applications and requests etc. that the Jews want to submit to the authorities, have to be sent to the Jewish Council for Amsterdam, respectively through the provincial or local representatives. 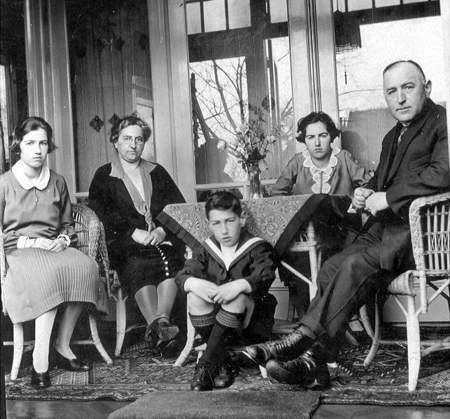 The Lobstein family on the porch of their home on Zuideinde. In spite of all the homage he had received in Meppel, Mr. Lobstein decided to move to Amsterdam, where he regularly had to go for his work. His wife’s desire to move to the capital played an important part too. His children had all left Meppel too. Just before the war he bought a house in Corellistraat in Amsterdam where they intended to live. 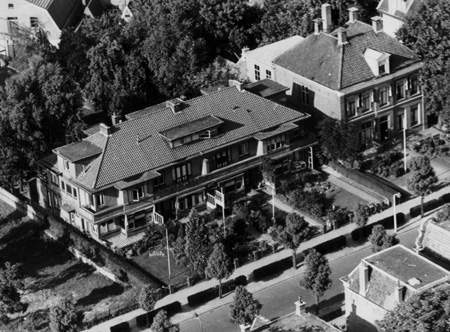 Their house on Zuideinde, next to the Rijks HBS (grammar school) had been sold. However, the Second World War made this move impossible. Mozes and Catharina had to look for another house in Meppel. They rented a house in Stationsweg owned by the Timmer family. By the end of September 1942 the house was claimed by the German army. Soon after, the Lobstein family was transported to camp Westerbork. They would never come back to Meppel. After a short stay in the camp they were allowed to leave early in 1943. For a while they lived in Amsterdam where Moritz worked at the Jewish Council, but they soon had to leave for Westerbork once more. The chance to survive got smaller and smaller, but a miracle happened. In Palestine, groups of Knights Templar were interned by the English. Attempts were made to exchange these people, who all had the German nationality, against Dutch Jews. This resulted in an exchange of 222 Dutch Jews, amongst them Moritz and Catharina Lobstein, for these Templars. On 14 November 1943 the Germans sent SS officer Gertrud Slottke to Westerbork with a list of the so-called ‘Palestine Jews’. She had been told to select suitable Jews to be sent to Bergen-Belsen, from where the exchange would take place. On 29 June 1944 Mr. and Mrs. Lobstein traveled via Istanbul to Haifa, where they arrived on 10 July. Catharina died in Palestine in 1946 (she had a weak heart), knowing that her children had all survived the war. Moritz returned to the Netherlands, but never came back to Meppel. Moritz Lobstein was the owner of a wholesale business in subtropical fruit and spices in Weteringdwarsstraat. He employed some twelve people, apart from the salesmen who were active throughout the country. Naturally the business encountered the consequences of the war, but it continued. From the annual reports of the agent of the Dutch Trade Company, Mr. J.Hulst, we know how the firm fared. In 1942 things were still reasonably good. Raw materials had become scarce, so one had to improvise. Surrogates, called ‘emergency spices’ were introduced. From then onwards, things went from bad to worse. In 1943 the business was under supervision, but there was no intention to liquidate the firm. The plan was to ‘aryanize’ it. However, in 1944 the Germans decided to liquidate the firm after all, which happened on 2 March 1945. The proceeds that amounted to fl 25,414.65 were transmitted from the Dutch Trade Company to the account the Deutschen Revisions und Treuhand Aktien Gesellschaft had with the Nederlandsche Bank at Almelo. Salom Lobstein (on the right) picked up the thread after the war. Here he is at work at the office of the firm of Lobstein. After the war Moritz started up the business with the aid of his son Salom, who became the manager through the years. Only when there was a special reason for it (for instance when Salom was on holiday) did Moritz come from Amsterdam to Meppel by train. Although it seemed he had retired from the business, he still made the important decisions. In 1954 the firm celebrated its 50th anniversary. They lost their independence when the company was bought by Catz International from Rotterdam in 1962. 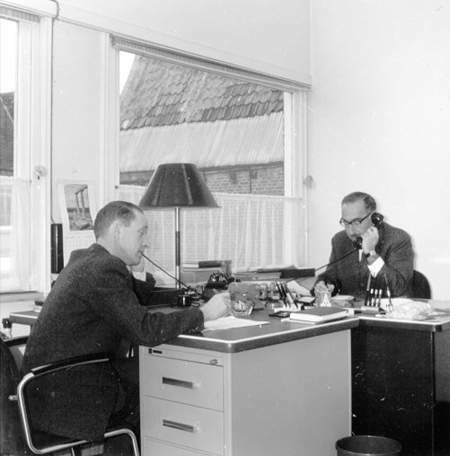 In the early seventies the firm moved to Groningen. Only a warehouse remained in Meppel. At the end of 1980 the Groningen branch was closed and only the headquarters in Rotterdam remained. The warehouse in Meppel also closed its doors then.